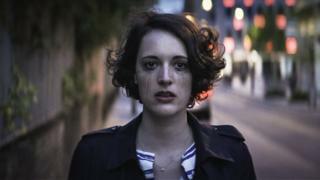 Fleabag will return to BBC Three for a second series in 2019, Phoebe Waller-Bridge has confirmed. Speaking at the Edinburgh Television Festival, she said she was "beyond thrilled to be coming back". "I asked myself if Fleabag has more to say and frankly she hasn't shut up since. Series two will be a whole new adventure," she said. The actress was speaking to Shane Allen, the BBC controller of comedy, who called the show a "modern classic". "Fleabag signalled the arrival of a hugely distinctive writer with the mesmerising performing talent to match," he said. "Phoebe's career has shot up like a firework display in the last year and the show has been rightly hailed as a modern classic. "It'll be thrilling to see where she takes the character in the next series." The first series was adapted from Waller-Bridge's award-winning play and no details have been given about what's in store for the second series. The dark comedy won numerous awards for Waller-Bridge including a Bafta and two Royal Television Society Awards.